Color selection in coastal living boy bedroom ideas is endless. My opinion is for the natural pastel tones and some fresh looking blue tones or turquoise. Printed, plain and striped fabric can be chosen. The wall murals or wall papers, some rugs wavy, sandy feeling rugs can be used to point out the theme. When I picked the pictures I admired the inspirational designers. Picture Credit: Jessica Bennett Interiors. Very frolic picture. The wall colors are on the ocean tone and horizontal stripes shows the levels of oceans.Sailboat wall art and simple design bed matching color with the area rug. I like the combination of navy blue, white , and green. The ottoman seems very puffy. Picture Credit: Nancy Lucas, Decorating Den Interiors. The color selection is very natural, this room can be used for both gender. I am very inspired. Rattan decorative pieces, plain bedding and two tone wall colors emphasize the theme. Starfish are bonus in the frame and on the shelf. Hardwood flooring is a good choice . Picture Credit: Maddie G Designs. Custom photo wall paper, such a nice idea to remind all time good memories at the beach. It can be applied any wall of the room. 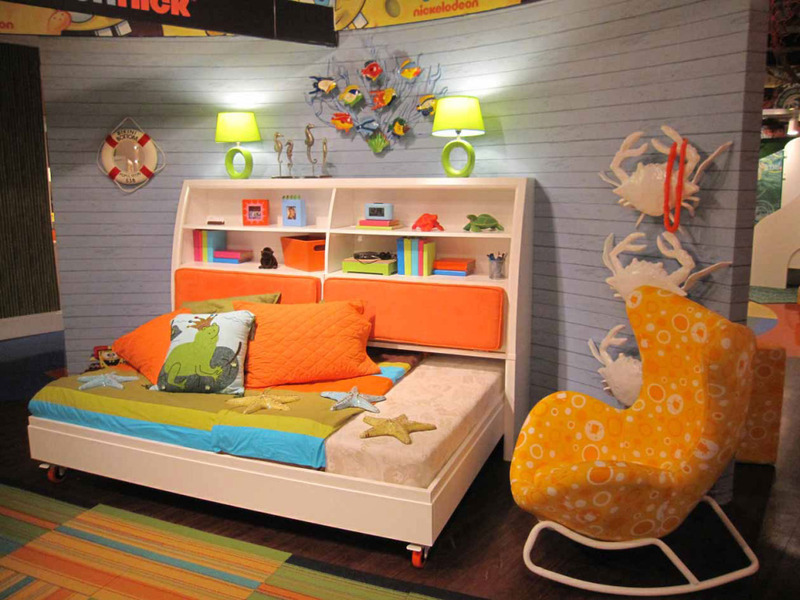 I like this kid’s space very much.All in one, reading nook, toys and memories. Picture Credit: Turbo Beds. Hmmm the rug looks like sand, the blue and white furniture with ocean buddies. All the details are related to the beach. Amazing colors for the bedding. Very beach inspired design. Customized Wall Mural and Customized Corner Lighting are on the Sand Color Carpet . Brown Dresser and Corner Table are Nice Combination. Picture credit:Erinteriors. Fondly seaside. the Corner shelf unit, corner lighting unit are both fascinating. Customized wall decor is very catchy. Dresser is the best color and shovel, rake, fish tank complete the scenic. Very cute idea. I am planning to write about to gone fishing in my next article. Stay connected and have a happy week.